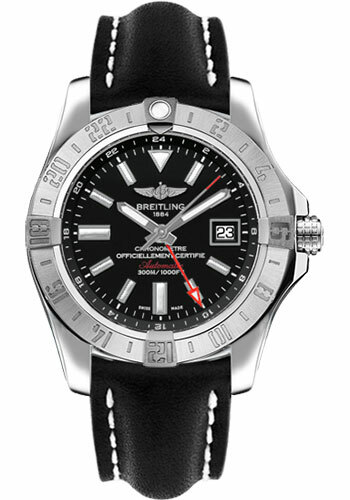 43.00 mm stainless steel case, screw-locked crown, bidirectional ratcheted bezel, sapphire crystal with glareproof treatment on both sides, Volcano black dial with index hour markers, selfwinding mechanical Breitling 32 movement with second time zone (24 hr) and date display, approximately 42 hours of power reserve, black leather strap with deployant buckle. Water resistant to 300 m (1000 ft). 43.00 mm stainless steel case, screw-locked crown, bidirectional ratcheted bezel, sapphire crystal with glareproof treatment on both sides, Volcano black dial with index hour markers, selfwinding mechanical Breitling 32 movement with second time zone (24 hr) and date display, approximately 42 hours of power reserve, blue leather strap with deployant buckle. Water resistant to 300 m (1000 ft). 43.00 mm stainless steel case, screw-locked crown, bidirectional ratcheted bezel, sapphire crystal with glareproof treatment on both sides, Volcano black dial with index hour markers, selfwinding mechanical Breitling 32 movement with second time zone (24 hr) and date display, approximately 42 hours of power reserve, brown leather strap with deployant buckle. Water resistant to 300 m (1000 ft). 43.00 mm stainless steel case, screw-locked crown, bidirectional ratcheted bezel, sapphire crystal with glareproof treatment on both sides, Volcano black dial with index hour markers, selfwinding mechanical Breitling 32 movement with second time zone (24 hr) and date display, approximately 42 hours of power reserve, gold leather strap with deployant buckle. Water resistant to 300 m (1000 ft). 43.00 mm stainless steel case, screw-locked crown, bidirectional ratcheted bezel, sapphire crystal with glareproof treatment on both sides, Mariner blue dial with index hour markers, selfwinding mechanical Breitling 32 movement with second time zone (24 hr) and date display, approximately 42 hours of power reserve, black leather strap with deployant buckle. Water resistant to 300 m (1000 ft). 43.00 mm stainless steel case, screw-locked crown, bidirectional ratcheted bezel, sapphire crystal with glareproof treatment on both sides, Mariner blue dial with index hour markers, selfwinding mechanical Breitling 32 movement with second time zone (24 hr) and date display, approximately 42 hours of power reserve, blue leather strap with deployant buckle. Water resistant to 300 m (1000 ft). 43.00 mm stainless steel case, screw-locked crown, bidirectional ratcheted bezel, sapphire crystal with glareproof treatment on both sides, Mariner blue dial with index hour markers, selfwinding mechanical Breitling 32 movement with second time zone (24 hr) and date display, approximately 42 hours of power reserve, brown leather strap with deployant buckle. Water resistant to 300 m (1000 ft). 43.00 mm stainless steel case, screw-locked crown, bidirectional ratcheted bezel, sapphire crystal with glareproof treatment on both sides, Mariner blue dial with index hour markers, selfwinding mechanical Breitling 32 movement with second time zone (24 hr) and date display, approximately 42 hours of power reserve, gold leather strap with deployant buckle. Water resistant to 300 m (1000 ft).